The Rowenta Company, founded in 1884, has been manufacturing clothes irons and improving their design since 1909. The most recent self-cleaning models are exceptionally easy to use and require little maintenance, as long as you use the self-cleaning feature every two weeks, as recommended. When you employ this feature, the iron's internal boiler blasts hot water through the steam ports, clearing them of scale and other debris present in most household water. Because the iron has this feature, you don't have to be too careful about the quality of the water you use for ironing. Unless it's unusually hard, plain old tap water is suitable and recommended by the manufacturer. The self-cleaning feature prevents scale build-up and streaking. Remove the protective film from the soleplate; locate the reservoir cover and open it. While the iron is unplugged, fill the reservoir to the maximum fill line with plain tap water. Do not overfill. You should unplug the iron whenever you fill the reservoir. Plug in the iron; set the control to maximum steam, and wait for the LED indicator to go off, which indicates the iron has reached the proper temperature. Hold the iron over a sink and press the steam button four times. Steam jetting freely from all the apertures in the soleplate indicates the iron is ready for use. Place the iron on a fire-retardant surface and set the heat control to an appropriate temperature for the material you want to press. Use the lowest setting (one dot) for nylon, the middle setting (two dots) for wool and silk, and the highest setting (three dots) for cotton and linen. The iron produces steam only in the triple-dot setting, so you can turn the variable steam lever off when using lower settings. Wait for the heat indicator light to go off before using the steam setting. 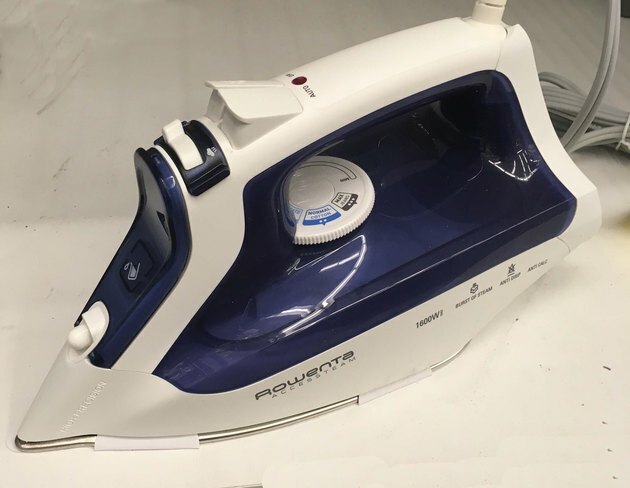 The iron automatically steams when it's in a horizontal position and stops when you set it upright. If you want to iron wrinkles out of fabric too delicate for steam, press and hold the spray button when the temperature setting in in the single- or double-dot position, and the iron will shoot out a jet of water. Press and release the button quickly to get a single squirt of water. Rowenta irons contain a built-in antiscale cartridge, which eliminates the need to add descaling chemicals to the water. However, scale can still clog the steam ports after extended use. Following the self-cleaning procedure every two weeks eliminates this potential problem. Unplug the iron; fill the reservoir to the maximum fill line, and plug it back in. Set the temperature to the highest setting (three dots). Set the iron upright, and wait for the temperature indicator light to go off. Unplug the iron. Hold it over a sink and move the steam control to the self-clean position, which is all the way at the end. On some models, the self-clean control is a separate lever on the side of the handle. Move this lever to the on position. Water will emerge from the steam ports and clean them. Allow the water to flow for one or two minutes. Move the steam control one notch from the self-clean position to maximum steam. Plug the iron back in; set it on its heel and allow it to heat up. The heat will evaporate all the excess water on the soleplate. After this has happened, unplug the iron and let it cool down, which could take as long as one hour. Use a damp cloth or sponge to wipe down the soleplate after the iron has completely cooled. Never use an abrasive cloth or cleaner to do this, as it will damage the protective coating on the plate.